Plot: While perusing Blofeld James Bond meets Tracy di Vicenzo, the daughter of crime lord Marc-Ange Draco, with whom he strikes up a romance. Bond also manages to infiltrate Blofeld’s latest operation in the Swiss Alps while undercover as a genealogist. 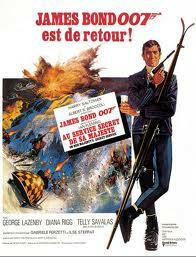 Review: And thus we find ourselves at the most divisive of the Bond films. 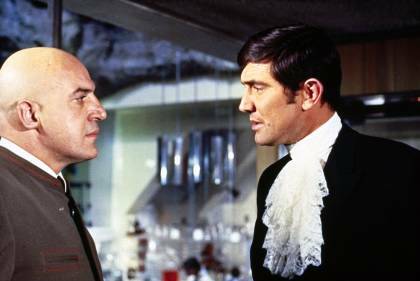 A real love it or hate it affair, it’s the first time in the official canon where the world’s most famous spy is played by an actor other than Sean Connery, with Australian George Lazenby stepping into the large shoes. One of the major arguments in the defense of this outing comes from the notion that out of the multiple films in the series based on Ian Fleming’s books this is the one that most accurately captures the story and the feeling of the print version of the tale, adhering strongly to the events of the novel. The direct response to this praise is that if one wants to experience something just like the books they should stick to reading, as the Bond cinematic franchise had long become it’s own beast. Not to mention that the process of adaptation requires flexibility as literature and cinema are two wildly different mediums. This is a movie riddled with problems. Some of them are merely cosmetic, and the few who claim that this is the best of the series are turning a major blind eye to this shoddy film-making. Most notably are the action scenes that take place later in the film. Aside from being so haphazardly edited they look as though a paper shredder had been employed, the post-recorded dialogue is laughably amateurish. Characters speak without their mouths moving and also sound as though they’re sitting in front of a microphone having a casual chat while engaged in a high speed car chase across ice. They could’ve put the work experience kid in charge of this portion of the soundtrack. The big issue is, of course, the new face of Bond. After the decision was made to recast the hero it was decided that his new appearance wouldn’t be explained away in the story (original drafts featured plastic surgery) and simply leave it unsaid. This does cause some minor confusion, such as why Blofeld doesn’t recognize him (which was left in after the plastic surgery references were omitted) but it wasn’t the first nor last time an actor was recast between films. Was is a very real issue is that the producers couldn’t decide if they wanted to reinforce that this was Bond as usual or a new, different Bond – so they just tried to do both. 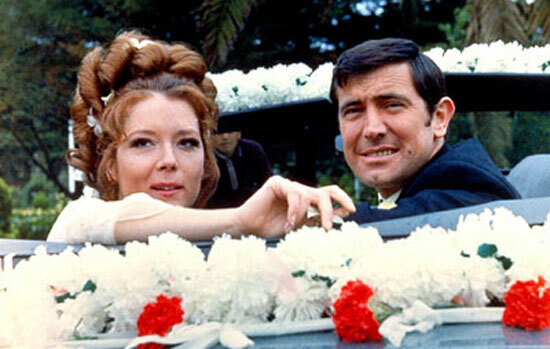 After the opening scene that ticks of some of Bond’s major traits, Lazenby smirks at the camera and comments that “this never happened to the other fellow”, cutting into the titles sequence that sees all of Bond’s previous adventure passing through an hourglass before the new guy steps up. All of this implies that Connery is the old and Lazenby is the new. Not long after this we have a scene where he reminisces about his past missions while looking at memorabilia from each one while the theme of each plays, indicating that this is the same guy with the same experiences – the exact opposite message. Pick one and go with it, we really wouldn’t have minded which. Lazenby himself cuts an impressive figure as an action hero, having a strong build and leaping into action with speed and agility. As Bond though he’s somewhat lacking. He doesn’t have the charisma or the screen presence that Connery had, instead he seems simply pleased with himself for being in the role and is happy to smirk his way through the part. Not that this really affects his performance, but he’s also kinda funny looking. When he rattles off his first line he looks as though his mouth is going to turn into a suction cup and attach to Diana Riggs face. As a stand alone movie, not part of an ongoing series, it’s a very solid espionage flick. The characters are interesting and there’s enough of a sense of mystery to engage the viewer. The secret agenda of Blofeld is unveiled at a steady pace with enough red herrings to pad out the plot. Bond getting around wearing a kilt and acting a dandy would be pretty hard to accept if it wasn’t a new face on the character. Later action scenes are plagued by the problems addressed above but the ski scenes are worth your time. The romantic sub-plot is certainly an interesting and still one of the most memorable supporting cast members of the franchise. Diana Rigg’s provides a good foil for Bond, being the damaged girl who comes to accept him as someone who can give her a better life. The relationship between Bond and her father – a crime lord – in also interesting but has the potential to be taken much further (although the wacky banter between the head of the British Secret Service and the crime lord about how many people they’ve killed is terribly out of place). For all the movies faults the final scene really packs a punch and remains one of the best moments in the franchise. Ultimately the movie is held back by poor decision making on the part of the producers and directors. Considering who else was considered for the role George Lazenby is, in hindsight, a poor casting choice to follow up Sean Connery.